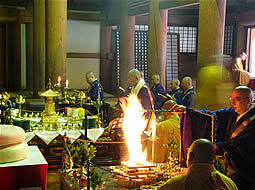 Godairikison ninno’e, as known as “Godairiki-san” and the largest event in Daigoji, is held on February 23rd every year. 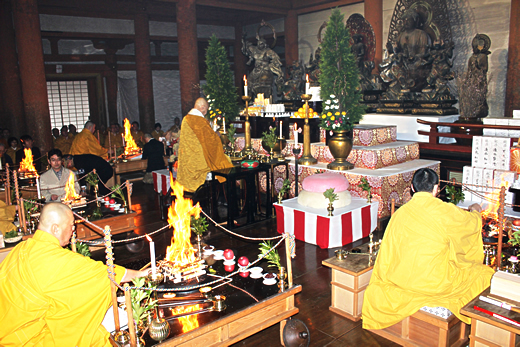 Monks are empowered by Godai Myo’o (5 great powers) including Fudo Myo’o and pray for peace, health and happiness of the country and people. This origin goes back to 907, Emperor Daigo’s time. Prior to the festival, more than 1000 monks from all the mountains in Daigoji gather and stay in a hall for a week up until the day of the festival to thoroughly pray with paper charms called Mie. This pre-event ceremony is open to visitors. On the day of the festival, more than 100,000 visitors join the ceremony and get the paper charms which can later be spotted everywhere in Kyoto especially at entrances of old stores and houses. In recent years, “Mochi age riki hono” (dedication of power by lifting a rice cake) has been famous. 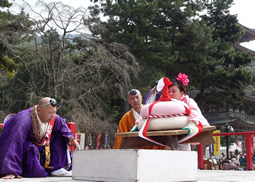 In this event, male participants try to lift a 150 kg piece of rice cake and female visitors try 90 kg to dedicate power and pray for their health and happiness. Copyright (c) 2008 DAIGOJI Temple. All Rights Reserved.